Krabi Town, capital of the province, is rather undistinguished, but dozens of islands, especially in Phang Nga Bay including Phuket, Koh Phi Phi, Koh Yao, Koh Lanta, some uninhabited islands as well as beach destinations like stunning Ao Nang and Railay can be reached from here with regular boat travel. Tour and transfer agencies are numerous al major tourist centers to arrange transfers. Alternatively most hotels will be happy to arrange tours and transfers for guests. Below we offer a compilation of short descriptions of the attractions in Krabi should you want to embark on these at your own time. Contact a representative at The Best Hotels in Thailand today for expert advice on not to be missed attractions, the best tours and things to do and see. Nature has been generous both above and below the emerald waters of the Andaman. Diving excursions is one of the most popular adventures and can be arranged from most beaches with many dive gear shops and agencies located at Ao Nang Beach. Liveaboard scuba excursions are also popular here. This will allow you to book an overnight trip on a very well equipped boat for anything from 3 to 7 days, ample time to properly explore the underwater treasures of the Andaman Sea including a ship wreck dive. 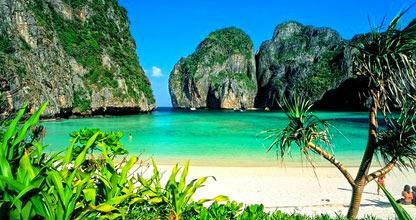 In terms of snorkeling, Phi Phi must be the easiest due the shallow water around its coast. 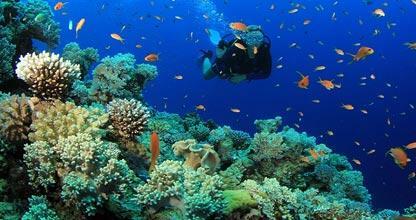 Koh Po Da Nock is another famous dive spot. Here, under water caves can be explored with the longest cave being 60 meters. Emerald green water, soft sand that sparkle, coral reefs and bright colored marine life, tranquility, peace and total relaxation defines the Phi Phi Islands. Phi Phi Don and Phi Phi Le are the two major islands in the archipelago. Snorkeling and scuba diving is an absolute must here and when you have the energy, follow the path behind Ton Sai Village and ask for the view point. Thirty minutes later you can take in the classic view of the spectacular surroundings. The islands can be reached by boat from Phuket as well as from Chaofa Pier in downtown Krabi. Tickets can be bought from the pier or from travel agents in town. During high season boats from Ao Nang to Phi Phi is also available.